They are backed by longer operating histories, larger scale, and improved credit profiles. Renewables issuers - particularly in the wind and solar sector - are likely to tap the bond market increasingly over the next few years, with their access supported by longer operating histories, larger scale and improved credit profiles, Fitch Ratings said. This lies on the back of a steady shift towards renewables amidst a projected rise in demand for energy in the Asia Pacific, driven by economic growth and long-term government targets for electrification. Whilst coal will continue to dominate the energy mix across the region, the rise of renewables could create competitive pressures for some coal-based power projects. Coal's contribution to electricity generation is above the global average of less than 40% in most APAC countries and is as high as 75% in India and 68% in China. Meanwhile, the success of Asian thermal power issuers in raising project finance has laid the groundwork for renewable issuance. “We expect continued innovation in financing options from renewable issuers, such as project bonds, asset-backed securities, ‘green bonds’, and infrastructure trusts, in addition to traditional debt instruments. 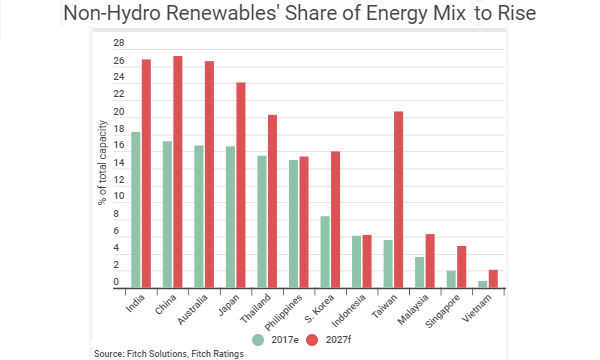 Renewable energy issuance has been limited so far in APAC,” Fitch Ratings said. The share of renewables in the region is expected to be lifted by falling technology costs and greater availability of cheaper finance for renewables issuers. Governments also remain generally supportive of renewables, but improving economics in the sector will allow the gradual withdrawal of subsidies, favourable feed-in-tariffs, and generous tax and accounting treatment. Taking these factors into consideration, offshore wind is likely to be the major addition to non-hydro renewable generation capacity in the near term, Fitch Ratings added. Just recently, Japan’s two houses approved a bill that will launch tenders of offshore wind facilities in five zones of the country’s territorial waters. Meanwhile, coal-fired projects that are exposed to the merchant market or unprotected by contractual termination compensation could face a risk of lower electricity sales or, in a worst-case scenario, early termination as a result of rising competition from renewable projects. Most of Fitch Ratings’ rated projects also have power purchase agreements (PPA) that largely protect them from the current high price of coal - by allowing them to pass through fuel cost increases to off-takers. “Fiercer competition for higher-calorific-value coal could still lead to some uncompensated increases in fuel costs if it undermines a power plant's operating efficiency, but any impact is likely to be limited,” Fitch Ratings added. Power projects funded by bullet debt are likely to face uncertain availability and higher costs of refinancing upon debt maturity. “Global monetary tightening is likely to continue to push refinancing interest rates higher over the medium term, whilst lower investor appetite for coal-related issuers could also increase their borrowing costs. However, most of our rated power projects have amortising debt profiles,” Fitch Ratings concluded.